Description: Wren is Dylan’s supportive girlfriend. 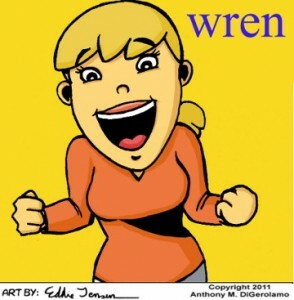 Prior to the start of the comic, Wren was the bread winner, but now she’s stuck at home emailing resumes and doing laundry. Bored out of her mind, Wren spends most of her day reading magazines and trying to ride out the terrible economic downturn. She is a bit impulsive, but hasn’t yet tried one of the odd jobs. Secretly, she’s glad that she doesn’t have to put up with all the craziness that Dylan sometimes deals with.